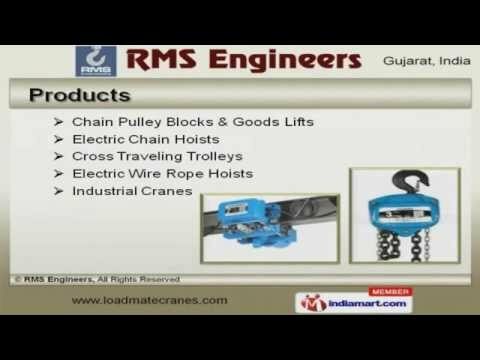 Welcome to RMS Engineers, Manufacturer and Exporter of Material Handling Equipments. The company was established in 2000 at Surat. Our Advanced R and D department and Current market dynamics help us to Cater Indian Subcontinent. Efficient after sales services, guaranteed client satisfaction and customized solutions are the plus points of our organization. We offer a huge gamut of Chain Pulley Blocks, Electric Chain Hoists and Cross Traveling Trolleys. Our Chain Pulley Blocks and Goods Lifts are a class apart. Electric Chain Hoists offered by us are extremely reliable. We also provide Cross Traveling Trolleys that are superior in performance. We are offering a top notch quality range of Electric Wire Rope Hoists that are one of the best in the market. We are one of the trusted names of the industry engaged in offering genuine quality Industrial Cranes.